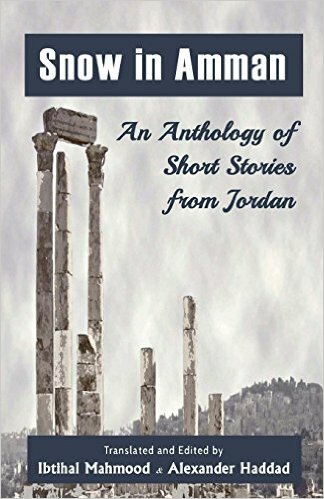 Snow in Amman: An Anthology of Short Stories is a collection of eleven contemporary short stories from Jordan translated and edited by Ibtihal Mahmoud and Alexander Hadded, with a foreword by Samir Al Sharif which provides a very brief overview of the Jordanian short story for the reader unfamiliar with the literature. As this anthology is aimed to introduce the reader to the Jordanian short story, it could have benefited from a little more of this framing. The stories are presented without dates or biographical information. That said however, this focus on the text itself has its own advantages and pushes back against the tendency to turn to Arabic literature as a form of ethnography. There’s also no messing about with glossaries and other forms of explaining the texts – there are only two footnotes. The anthology includes works by al Sharif, Elias Farkouh, Basma el-Nsour, Ahmed Abu Hleiwa, Magdalene Abu el-Rub, Asmaa al Mallah, Manal Hamdi, Musa Abu Rayah*, Khalid Yousef Abu Tamaa,and Julnar Zain. The translation for the most part achieves the “honest rendering” to which it aspires. There are passages that I can imagine would have been difficult to translate, but which are wonderfully translated, in each of the stories, such as this one from Abu Hleiwa: “Tradition – that unwritten, unspoken martial law – snuffled like a dog at the burned out corpse of our humanity.” Some word choices mark the difficulty of the process, such as “belle”, which with its connotations seems jarring, but I imagine it was standing in for the word “hasna’aa” and what other word could have conveyed the meaning? The tensions in this story between a single woman asserting her freedom and yet wanting to be accepted by society appear in a more allegorical form in Magdalene Abu el-Rub’s story, about a young woman who tries to escape her abusive family, and Manal Hamdi’s Stained by Roses, narrated by a lonely seamstress. While some of the stories were a little too abstract and philosophical for my taste, and a few others employed prose that was a great deal too saccharine, these three stories, like the final one by Julnar Zain, blended elements of the fairytale, the morality story, and a kind of bitter realism in unexpected ways. Although the choice of texts is somewhat uneven, and some word choices in translation inevitably appear out of place, Snow in Amman is a great introduction to the Jordanian short story. I’m certainly going to go look for more work by some of the writers and would love to see a longer anthology. *Had some difficulty with the transliteration of this name and rendering it in Arabic. Is it راية or رية or رايا or something else entirely? Get in touch if you know!